Veggies, a little lime juice and spices wrapped in fried wonton wrappers. Sounds simple enough, right? Except it’s not, because all together they make something so delicious you’ll start to think that maybe there is real good in the world: avocado egg rolls. We whipped some up ourselves and let’s just say there was almost a fight over the last one .Don’t believe us? Check out this recipe for avocado egg rolls yourself, you’ll see what we mean. Heat vegetable oil in a large skillet or deep fryer over medium high heat. In a medium bowl, gently mash avocados using a potato masher. Add tomato, red onion, cilantro, lime juice, salt and pepper, to taste, and gently toss to combine. Working one at a time, place avocado mixture in the center of each wrapper. Bring the bottom edge of the wrapper tightly over the filling, folding in the sides. Continue rolling until the top of the wrapper is reached. Using your finger, rub the edges of the wrapper with water, pressing to seal. Repeat with remaining wrappers and avocado mixture. Working in batches, add egg rolls to the Dutch oven and fry until evenly golden brown and crispy, about 2-3 minutes. Transfer to a paper towel-lined plate. Serve immediately with cilantro dipping sauce or sauce of your choice. 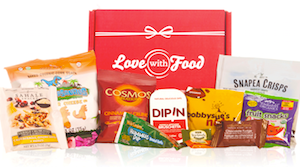 Want yummy snacks on-hand every month with no prep time? 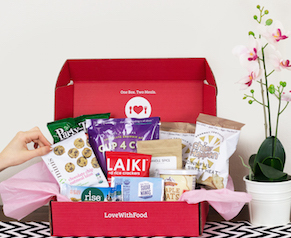 Sign up for a Love With Food snack box today!